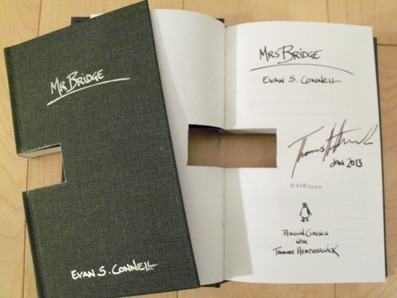 This limited edition brings together Evan S. Connell's novels "Mr Bridge and Mrs Bridge". Thomas Heatherwick, who most recently designed the new London Routemaster Bus and the spectacular Olympic Cauldron, has specially created this beautiful and innovative interlocking edition, available in a limited print run, which echoes the books' twin narratives. They can either be read separately, or slotted together. Renowned designer Thomas Heatherwick is famous for projects as diverse as the Seed Cathedral at the Shanghai 2010 World Expo, the East Beach Cafe in West Sussex and the flagship Longchamp store in New York. 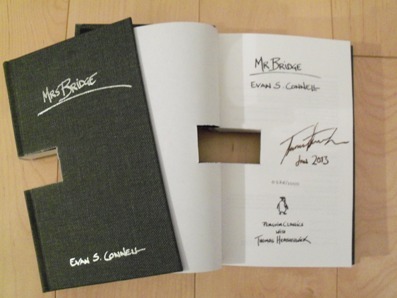 A new edition of Evan Connell's "Mr Bridge" will be published in "Penguin Modern Classics" in February 2013 as a companion work to sit alongside "Mrs Bridge". "The Penguin Modern Classics" edition of Mrs Bridge includes an introduction by Joshua Ferris; Mr Bridge is introduced by Lionel Shriver. Synopsis : The Bridges are an unremarkable and conservative couple who live in Kansas City with their three children. Mrs Bridge spends her time shopping, going to bridge parties and bringing up her children to have nice manners; Mr Bridge is an outwardly successful lawyer who only wants the best for his family. And yet sometimes both experience the vague, disquieting sensation that all is not well in their comfortable lives. In a series of comic, telling vignettes, Evan S. Connell illuminates the narrow morality, confusion and even terror at the heart of lives of plenty. Hilarious and heartbreaking in equal measure, these two novels - told from both perspectives of the marriage - deserve their place amongst the classics of American twentieth-century fiction. Evan S. Connell was born in Kansas City in 1924. He wrote Mrs Bridge in 1959 and Mr Bridge in 1969, and was nominated for the Man Booker International Prize for lifetime achievement in 2009. He died on the 10th January 2013. Thomas Heatherwick is the leading British designer responsible for the Seed Cathedral at the Shanghai 2010 World Expo, the flagship Longchamp store in New York, and the new Routemaster buses in London. 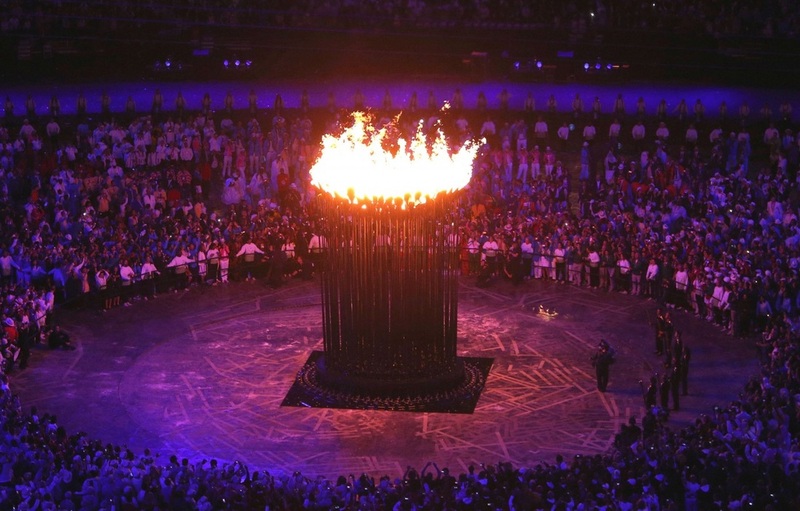 His most recent project, the cauldron in the Olympic Park, was the centrepiece of the opening ceremony and received universal acclaim. On the design, Thomas Heathewick says "The studio was interested in the idea that single sheets of paper are thin and delicate, whereas hundreds of sheets put together and bound into books turn into dense blocks. Might it be possible to treat these blocks in the same way as a plank of wood? Using woodworking tools to create a simple joint, the studio slotted two books together to form a self-supporting structural composition. The small missing section of each page gives the text an unusual composition. 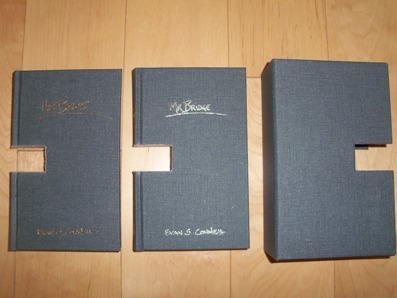 Using the idea of the Interlocking Book to express a connection between two separate texts with related subjects, Penguin Classics is publishing a limited edition interlocking version of Mrs Bridge by Evan S. Connell and its companion novel, Mr Bridge. These classic pieces of twentieth-century American fiction, originally published ten years apart, tell the story of a troubled marriage from the perspectives of both the wife and the husband"